Wadswick is a very rural area with picturesque, well-kept houses grouped into four small hamlets: Chapel Plaister, Wadswick (sometimes called Upper Wadswick), Lents Green and Longleaze Cottages (Lower Wadswick). The hamlets are mostly grouped along Wadswick Lane. The area is very ancient and very independent, a long way from facilities at Box or Corsham. There was a large population in the area in Victorian times and thriving local employment based on agriculture and quarrying. In 1911 the census showed 26 households in Wadswick, of which 11 were working in agriculture and 10 in the quarry trade. These trades were traditionally the basis of the area. In 1840 it had its own Public Inn, called Chapel Inn, run by James Brittain who tenanted it from the Northey family. It is shown at plot number 667 in the Tithe Apportionment map below. Wadswick Lane had its own toll house but this has not been located. William Jeffery Brown, a well-known local farmer, was the tenant of Hazelbury Farm (Hazelbury Manor) for many years, renting it from the Northey family. William Jeffery Brown was a local person, born in 1822 and had grown up on his father's farm at Wormwood, where William Brown senior farmed 700 acres and employed 57 labourers in 1851. 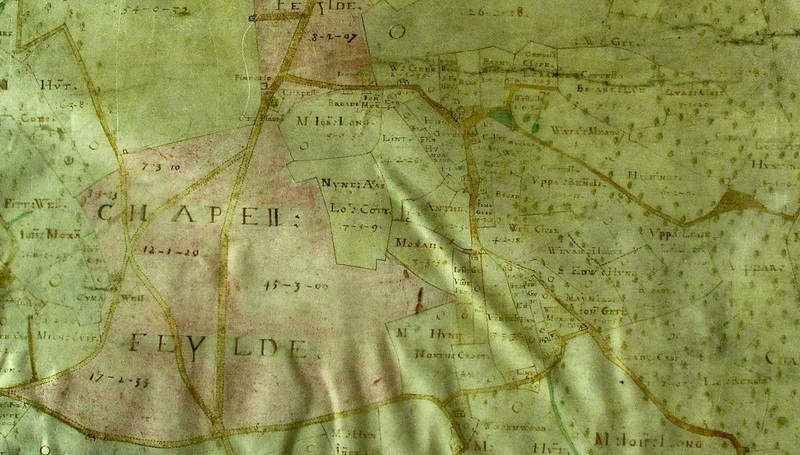 It is probable that the farmland covered the area we would now refer to as Wormwood, Wadswick and Hazelbury. In 1840 William Brown senior owned and occupied the buildings shown at entry 449 on the Tithe Apportionment map. In 1856 William Jeffery Brown held the famous Chippenham Agricultural Show ploughing match at Hazelbury. He was deeply interested in the contest, a former all-England champion ploughman and had won various local competitions. Over 40 ploughmen took part in 1856 in various competitions, including ploughing by oxen. Mr Brown appears to be a good employer and at the Chippenham show of 1858 he commended Ann Ford, his dairy maid, for completing service of 9 years and 4 months. The Chippenham Agricultural Show was so popular locally that in 1862 the village held its own contests, both for ploughing and a horticultural exhibition. It attracted the interest of local farmers and notable villagers including Dr Martin, Rev Horlock and Mr Straun Robertson. The number of individual classes was quite remarkable as was the special mention which went to the ploughing skills of 13 year-old Joseph Burt who ploughed with two oxen. It was a significant demonstration of the wealth of the Wadswick area in the 1860s. And William Jeffery Brown was duly recognised when he was appointed a Poor Law Guardian in 1869. When the agricultural depression began in 1870, William Jeffery Brown immediately sold his Home Farm dairy enterprise at Wadswick, including the whole of his dairy stock, dairy utensils and his young steers. It isn't certain if the farm was Wadswick or Bailiff's Farm. We get some idea of farming at that time from the stock he was selling: capital teams of draught horses, thirteen young and useful dairy cows, no bull (he presumably hired in when needed), four rams and a very choice fat pig. It was a limited return on rented land with plenty of cheese-making equipment, including screw vats, butter scales, butter kniver (sic) and two sets of cheese shelves. He did not stop farming, however, and was still selling sheep from his Hazelbury Farm at Kingsdown Fair as late as 1884 but by 1891 had retired and lived at Middlehill House. The number of farms in the area is unusually high, from the Bradford Road going east: Chapel Barn Farm, Wadswick Farm, Manor Farm (previously called Bailiff's Farm), and, just outside the scope of this article, Wormwood Farm. The property shown at reference 676 on the Tithe Apportionment map was described as two cottages in 1840. They were owned by William Brook Northey and Edward Richard Northey and tenanted by Joseph Dory, James Dory, John Day and John Edwards, who occupied a huge amount of land in the area in the late Georgian and early Victorian periods. Although referred to two cottages and gardens, rather than as a farm, part of the site was called Barn and Barton (farmyard). Thomas Wright (1834 - 1927) had taken over Wadswick Farm by 1886, farming 165 acres with 3 men and 3 boys in 1891. He had at least 3 daughters and 4 sons, including Jesse Wright (b 1867), of whom more later. Thomas held the Chippenham Agricultural Show in one of his fields and a supper that evening attended by Lord Henry Bruce, MP, who reported on farming hardships, including that of a landlord having to take 20 percent off his rents. There were the usual culprits, foreign imports, cheap railway fares subsidising imports, and high local taxation. The status of the Wright family obliged them to compete in local agricultural shows and their staff won various prizes. In 1886 Henry Helps, servant to Mr Jesse Wright, won a ploughing competition using a Ransome's plough. In 1888 Fred Scott, servant to Mr Thomas Wright, took the Boys' Class first prize worth £1.1s. But it was a most difficult time to be in farming and Jesse Wright could only afford to live in a cottage in Wadswick in 1891. By 1911 the family had left the area and the Rowe family had taken over the farm. The Toghill family came to Wadswick from Cold Ashton about 1880. The father, Charles (b 1851), was called an Agricultural Labourer in 1881. He was hard working and learnt various skills; in 1887, described as servant to Mr Wright, he was highly commended in a ploughing competition, and by 1901 he called himself Carter on Farm. Children: Ellen Lou (b 1874); Herbert Charles (b 1876); Eliza B (b 1879); Mary A (b 1881); Thomas H (b 1882); Florence E (b 1884); Emily M (b 1885); Selina Mary (b 1887); Bertha Kate (b 1888); Louisa E (b 1889); Albert W (b 1890); Ernest V (b 1891); Rosa A (b 1892); George F (b 1893); Jesse E (b 1899). In 1911 Thomas Toghill was still living in the area and working as a shepherd in the property next door to the Rowes. With Thomas and his wife were two other siblings, Albert, a Horseman on Farm, and George, Farm Labourer. This farm is shown at entry 442 on the 1840 map described as Bailiff Farm, Farmhouse, Barton and Outbuildings. The word means a steward who oversaw an estate on behalf of the owner. The farm was shown as a building on Francis Allen's 1626 map. Clifford James Eddolls (1879 - 1952) was described as an employed Farm Bailiff in 1911, living in a house with 7 rooms, presumably Bailiff Farm, with his wife Martha Mary (1874 - 1951). In the 1930s their second daughter, Ruby Jane Elizabeth Eddolls, married Cecil George Tanner. The newspaper carried a large report about how beautiful Miss Eddolls looked and that the bride is very popular in Box and will be missed by her circle of friends. She had previously worked for Mr and Mrs Kidston of Hazelbury Manor. Roger Barton bought the farm when it was owned by Mr Morrison, Member of Parliament for Devizes after the Second World War. Part of the area is still tenanted from the Fuller estate. Various other farming families are mentioned in newspaper reports. In 1919 Frank Hancock, a carter worker, employed by Mr John Marsh of Wadswick was injured by a horse while working in a hay field. It was short-lived and John Marsh sold up his live and dead farming stock a year later, when his landlord the Northey family were seeking to sell the farm. The Hancock family continued to live in Wadswick and work in farming. In 1924 George Hancock was injured by a bull in the farmyard of Mr Vincent Bishop of Wormwood Farm. There is some confusion about which farm Vincent Bishop occupied because in 1929 he was ordered to pay rent arrears to the executors of GP Fuller for his tenancy at Wadswick Farm. The Bodman family lived at Wadswick for thirty years. Henry Bodman had worked for Major Pollard at Spencer's Farm, Ashley for long time until his death in 1936. F Smith of Wadswick sold Christmas trees in 1920. In 1869 J Greville of Wadswick advertised her services as house and parlour maid and a year later, still without work, as good plain cook. 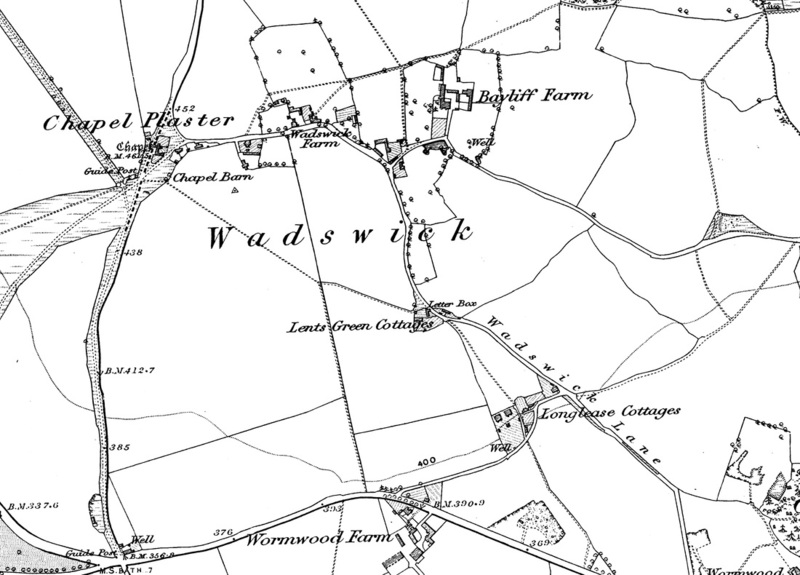 There were several small quarries at Wadswick, as seen on the attached map. They were referred to in 1942 when walling and paving stones could be bought ex-quarry. The quarries were still remembered after World War 2. In modern times local quarryman, Frank Elms, recalled that rubbish was burned or taken to Wadswick Lane where a few railings had been erected over an open quarry for the disposal of such rubbish. Many villagers worked in them including Herbert Charles Toghill who had started as a Farm Servant in 1891 but by 1901 had left to become a Stone Quarryman Miner. In 1911 he was married and living at Longsplatt working as a Steam Roller Driver. With a growing family he moved back to Lower Wadswick where he took work as a quarrymen. They suffered a terrible tragedy in 1925 when Herbert Charles fell to his death at Wraxall Quarry leaving a widow, Lily Edith Toghill (nee Archer), and nine children. A stage of rails and sleepers had been made across the mouth of the vertical quarry shaft owned by the Bath Stone Firms Ltd which collapsed. Herbert Charles fell 60 feet into the black chasm where he drowned in ten feet of water. His neighbour, Joseph Bird, who had worked together with the deceased since they were boys, was lowered down the shaft and he secured the body so it could be recovered by crane. Joseph Bird was a well known local character. He was first mentioned in April 1902 when he was fined for riding his pushbike at 10pm without a light. In his defence Joseph said that it was a moonlit night but, nonetheless, he was fined 10s or 7 days' imprisonment. There are several newspaper references to local residents. In 1856 the death of Mary Milsom of Wadswick was recorded in her 101st year. In periods of hardship people often do unpredictable things and in 1887 Henry Mainley was imprisoned for two months hard labour for a violent assault on his father at Wadswick. It was not the only case of assault because in 1895 Thomas Bailey of Wadswick won a charge of a vicious assault by Alfred Marsh, a stone merchant, and George Phelps, blacksmith. Just at the moment when Mr Hill, a surgeon of Box, gave evidence that Thomas Bailey's injuries had brought on a form of brain disease, so the defence lawyer was himself seized with a fit and the judge and jury swiftly concluded matters upholding Bailey's claim for damages. We get other glimpses of people at this time. In 1899 F Rowe of Wadswick offered a reward for returning his lost black retriever dog but gave no address, assuming people would be able to locate him easily enough. Then there was the usual run of births, deaths and marriages such as Isaac Ford who died aged 82 in 1892 and the wife of Dr CC Vacy-Lyle who gave birth to a son in 1897. The Razey family lived at Chapel Plaister and Thomas and Kate (nee Tiley) celebrated their golden wedding anniversary in 1935. Mr A Jenkins of Wadswick was a champion bull-terrier breeder whose dog Notton Crusader won Crufts in 1948. The Moules family lived at Wadswick including Mr and Mrs James Moules and their children including Bert Moules who married Nellie Greenman in 1936. Other children included Maurice, Arthur, William, George and Mrs E Ward. Nellie Moules frequently played piano at Box Methodist Church. Considering the few people in the area and the prominence of farming (an exempted industry) the area had a strong commitment to service in wartime. Arthur John Cox of Wadswick lost his life in November 1918, a few days after armistice was declared, probably of infection caused by a war wound. He is remembered on the Box War Memorial. Ernest Barnett, F Biggs, NG Cox, C Humphries and W Pinnock also served and are listed in the Roll of Honour. During the Second World War, the area functioned with its own Home Guard platoon with 18 men under the control of Mr BW Gibbon. A most unusual epitaph came not at wartime but at peacetime in 1864. It was to Captain John Hanning Speke, the African explorer who discovered Lake Nyasa, source of the White Nile. He died in a shooting accident whilst visiting his cousin Mr George Fuller at Neston Park in September 1864 and a monument to the tragedy still stands at Wadswick. The area continued to be isolated up to modern times. Wadswick Common was often used by traditional groups of gypsies in horse-drawn wagons and caravans and often sold pegs in Box village. When an elderly gypsy woman died on the common her covered wagon was burnt as tradition demanded. We would love to hear from you if you are able to add to the story of Wadswick and its residents and particularly if you have any photos of the people and events. In the next issue we have an article about the farmer William Jeffery Brown and his family.